The real Super Bowl is going to be played between two teams of professional athletes. This Super Bowl featured a team of genetically-engineered supermen and a team of pencil-legged children. The results were not pretty. Concluding his excellent "Breaking Madden" series, in which he's tried to do all kinds of horrible things to EA's sports series, SB Nation's Jon Bois has designed (and played) a Super Bowl quite unlike the real thing. He wanted to see what happened when you made the most lopsided encounter possible. On one side, the Seattle Seahawks. 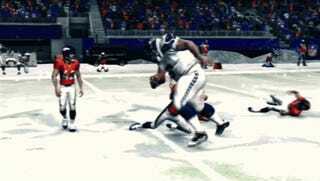 Its 41-man roster has every player at the absolute maximum statistic Madden will allow. Meaning every single one of them is "seven feet tall and 400 pounds heavy, and that there is no stronger, smarter, faster, or more skilled football player on the planet." On the other side, the hapless Denver Broncos. Every man has the absolute minimum statistic Madden will allow. "They are as short (five feet tall) and light (160 pounds) as the game would allow me to make them", Bois writes. "In every single skills category — Speed, Strength, Awareness, Toughness, and dozens of others — I assigned each of them the lowest rating possible." The game doesn't just end up lopsided, it breaks Madden completely, the game unable to even finish. The story is great, the highlight gifs are even better.